Some Dealers and Wholesalers buy "Salvage" or "Recondition" vehicles, then illegally "cleaned" their titles before they sell to the general public. It is estimated that 1/3 of the totaled vehicles on the road today will have no documentation to show that the vehicle was once declared as salvage. CARFAX can not report a total vehicle if the state did not create a salvaged or reconditioned title for that vehicle. One of the big concerns for used car buyers is the way the used car industry recycles totaled vehicles back onto the used car lots. These once salvaged vehicles create a financial and safety risk for the general public. Today's cars are built using robots to make precise welds during the assembly process. These welds are were made in an enclosed environment on perfectly formed metal to create a structural cage designed to protect the passengers. When a vehicle is in an accident, the structural components absorb the energy of a collision by crumpling and deforming the frame to protect the passenger compartment. Once the frame has been wrecked, it cannot be un-wrecked. A vehicle is declared a total loss by an insurance company, either by collision damage, fire, flood, theft recovery, etc. A total loss means the vehicle cannot cost-effectively be repaired to mechanical and/or structural safety standards, and should be cannibalized for parts only. The regular title is normally surrendered to the State, and the State would issue a salvage certificate. The salvage wreck is then sold to a salvage yard or through a salvage auction. However, unethical repair shops and dealers buy these salvage vehicles. 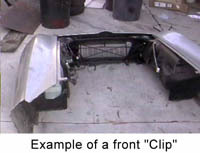 They attempt to repair these totaled vehicles, and/or they will cut off or "Clip" the good sections off and reassemble these sections to create a another vehicle. Many of these salvage vehicles will look good but the structural components are still damaged and not repaired. While these cars may look good with a fresh coat of paint, they are structurally and mechanically unsound and worth only a fraction of the book value. Once again, these vehicles were declared "Totaled" by the insurance company. But what about the title? These salvage rebuilders ask the state to issue a negotiable title. Since the totaled vehicle was issued a salvage certificate the state will issue a title with the designation of "Recondition" or "Salvage" which means the vehicle was rebuilt from salvage. Beware, these "Recondition" or "Salvage" titles can be "Washed" or "Cleaned" by simply transferring the title back and forth to another state which does not include "Recondition" or other discrepancies on their titles. 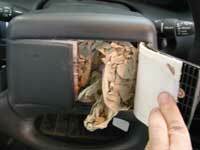 Recondition vehicles are not recommended for purchase. These cars may have chronic mechanical problems and there is no way to determine if the vehicle is structurally sound. In a minor collision, the car's frame is likely not to protect the passengers. "Salvage" vehicles are not subject to federal safety standards. Totaled vehicles from flood damage may not have any structural problems. However, these cars will have chronic electrical, mechanical, and rust problems. CBS News' 60 Minutes estimates that 1 in 15 vehicles on the road today have been created from salvage. You cannot negotiate your best deal until you know the EXACT condition of every component and system. Content may be reproduced with prior authorization at contact@AutoPI.com.